Almaty is located in the south-eastern part of the country, in the foothill of North Slope of Zailisky Alatau at the altitude of 600-900 meters above sea level. Population of the city is more than 1,5 million people. Climate is from continental to subcontinental. Southern and Northern parts of the city are located in different climatic zones. 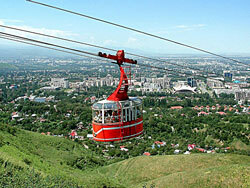 Name of the city “Almaty” comes from the word apple. These are places where the famous sort of apples almaty aport has been raised. 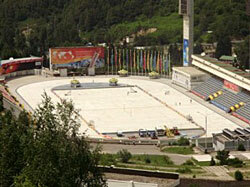 Some sources say that in ancient times, on this place, on the famous Silk Road, there was Almaty trade settlement. 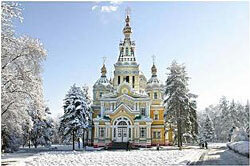 In the year 1854, not far away from ruins of an ancient city, the city of Vernyi has been founded. In Soviet times the city was renamed to Alma-Ata, since year 1929 to 1997 Alma-Ata has been a capital of Kazakhstan; that is why, since then, “Southern Capital” is the unofficial name of the city. 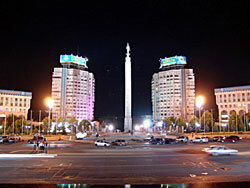 Southern Capital is by right the cultural center of the republic. This city provides a lot of opportunities for cultural as well as for active rest. There are a lot of theaters, museums, more than 100 monuments of history, architecture and monumental art; as well as several green parks, restaurants and night clubs, dozens of cinemas, circus, about one thousand sport complexes operate around the city. 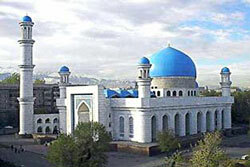 Mosque. Besides central mosque, there are more than 20 mosques, Islamic Cultural Center of Mubarak and university, which operate in the city. While visiting mosque, men should come only in long pants and headwear; women should come in long clothing and with shawl covering head. In some mosques you can take shawls at the entrance. It is not desirable for women to come in pants or short skirts. You cannot wear shoes in mosque, you should leave them at the entrance. Koktobe - is the best place for review of the night city. (1,070 meters above sea level). Park of 28 Panfilov heroes. This park is famous with its Memorial of Fame, Alley of Memory, and Eternal Flame. There are 28 granite monuments with names of heroes who died in fight for Moscow city during the Second World War, set in the Alley of Memory. Holy Ascension Cathedral of Russian Orthodox church (archiutect A. Zenkov). This cathedral is one of the nine most unique monuments of wooden buildings in the world. It was built in 1904-1907, withstood the earthquake of 10 points on the Richter scale in 1911. Its murals and interior decorations astonish visitors’ imagination with beauty and magnificence. Museums. Attractive with its large collections is the Central State museum of the Republic of Kazakhstan and Fine Art museum named after A. Kosteev; a Museum of Kazakh national instrument is also a unique place. In the museum of gold and precious metals history of jewelry of Kazakhstan is represented. There are also a lot of picture galleries in the city. Medeo. World famous Medeo mountain skating rink was built in 1972 in the scenic gorge, which is located 15 kilometers away from the city. Chimbulak. An alpine ski resort is located in the scenic gorge of Zailiskiy Alatau at an altitude of 2,260 meters above sea level, 25 kilometers away from the center of Almaty city in the Chimbulak gorge. Ski slopes of Chimbulak are attested by FIS (International Ski Federation). Tracks of downhill skiing and giant slalom are by right in the top ten most complicated tracks in the world.